11 Şubat 2019 Pazartesi 17:00 - 3 reads. In an interview with the Norwegian newspaper Dagbladet published 2. February said the Nicaraguan police chief Francisco Díaz that "voluntary police" was used to shut down demonstrations in the last year, along with professional police in covert operations. Now wakes the interview and an accompanying video recording quite a stir in Nicaragua. - In reality this is a confession from the top police chief, believes the secretary general Marcos Carmona in menneskerettighetsorganisasjonen CPDH according to the TV channel and the website Vos TV . dozens of people were killed in the demonstrations that began 18. april of last year. They were the prelude to a rebellion that has cost at least 325 persons life. According to human rights organizations such as Amnesty was the police and civilian, regjeringslojale groups behind most of the violence - something the police have rejected. Now believes author and journalist Fabián Medina in storavisa La Prensa that Francisco Díaz in the Dagbladet interview has revealed the police's actual role. "Without wanting it, has the police chief Francisco Díaz provided an enormous contribution to the ongoing investigation in Nicaragua after the massacre in 2018", he writes. He believes politisjefens statements that "volunteer police officers" was inserted against the protesters along with professional police in covert operations is a crucial admission. "It means that there are registers with the names of those who participated," writes Medina. In the interview, which was done the 30. november, defended Díaz that both police their own, civilian people and sivilkledd, so-called "voluntary police" acted with ski masks. While Díaz believed this is in line with the law, points out to the other among other things, that the "voluntary police", according to the law should be dressed in uniform. Not everyone was a volunteer police, but also our professional police officers, " said Díaz, and explained that the latter was politiagenter in "covert operations". Both parts have created indignation in Nicaragua. Tuesday for a button week ago, Dagbladet video to go "viral" in Nicaragua. Since then the case has been cited by the media in Nicaragua and a number of other Latin american and Spanish-speaking countries. What he [Díaz] admit is that they are a kind of criminal, because it was they who killed the people in Nicaragua, quoted the general secretary Marcos Carmona in the CPDH in several media. 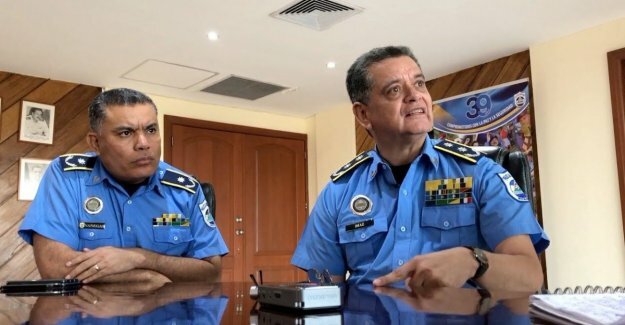 He believes that it should be opened a legal against the police and the paramilitary groups "which they admit is the police themselves", in order to have cost over 300 nicaraguanere life. - In reality this is a confession from the top police chief, is quoted Carmona. In the interview with the Norwegian newspaper Dagbladet said police chief Francisco Díaz, however, that he has not violated any human rights.